Size of this preview: 778 × 600 pixels. Other resolutions: 311 × 240 pixels | 623 × 480 pixels | 996 × 768 pixels | 1,167 × 900 pixels. This painting is one of predella panels of the Pisa Altarpiece. 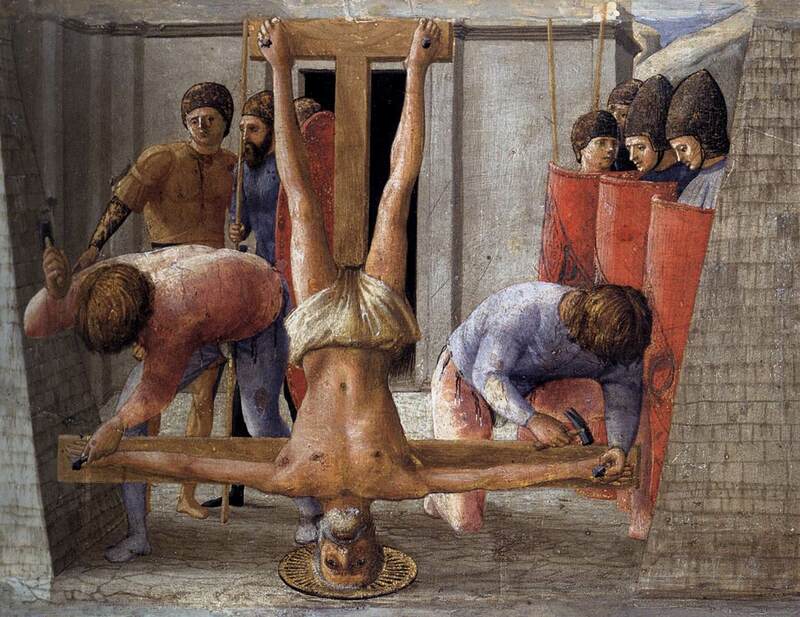 This subject had presented difficulties for artists because St Peter, to avoid irreverent comparison with Christ, had insisted on being crucified upside down. Masaccio meets the problem by underscoring it, the diagonals of Peter's legs are repeated in the shapes of the two pylons, which are based on the ancient Roman Pyramid of Gaius Cestius. Between the pyramids, the cross is locked into the composition. Within the small remaining space the executioners loom toward us with tremendous force as they hammer in the nails. Peter's halo, upside down, is shown in perfect foreshortening.